Despite Microsoft appearing to be in the dumps after laying off some 18,000 employees and shuttering Xbox Entertainment Studios the company has announced some profitable fourth quarter numbers. The Redmond company announced its revenues for the quarter ending on June 30 peaked at $23 billion (about £13 billion, AU$24 billion), up 18% compared to last year. As Microsoft came to own Nokia, phone hardware contributed $1.99 billion (about £1.1 billion, AU$2 billion) to Microsoft's yearly revenue. However, expenses relating to the purchase amounted to $127 million (about £74m, AU$135m) and resulted in Microsoft missing earnings per share expectations. Microsoft Chief Financial Officer Amy Hood noted the company is going through evolutionary changes that are "painful" but "necessary." Although Hood didn't directly address Microsoft's recent downscaling actions, these comments seem to allude to an explanation for them. Microsoft CEO Satya Nadella shared some much more pointed comments explaining it has decided to focus specifically on games for the Xbox One. However, we could see Microsoft's music and video ambitions expanded to a wider audience on PCs and laptops. The operating system maker also noted the strong quarter was driven by a push into cloud services. This includes everything from Windows 8.1's cloud syncing, and 5.6 million Office 365 Home and Personal subscribers. Nadella also announced Microsoft is doubling down on Xbox One's cloud-enhanced gaming and enterprise-grade cloud services called Azure. The Microsoft head said his company is doubling capacity on Azure servers as well as expanding to new territories, including Brazil and Japan. Even Bing is pulling some numbers with US search share growing to 19.2% whilst advertising revenue through the search engine increasing by 40%. 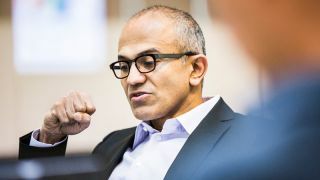 Nadella said in the future Microsoft will continue to merge its business and professional software solutions together as it did with combining Link into Skype as well as turning Outlook into its sole email client. Of course Microsoft isn't just a software company. In the financial report the company revealed Surface revenue reached $409 million (about £239m, AU$435m) aided by second-generation Surface 2 and Surface Pro 2 devices, along with the recent launch of Surface Pro 3. The Xbox One is also fairing ever so slightly better as well with revenue increasing to $104 million (about £60m, AU$110m). Microsoft says it has sold 100,000 more consoles than the 1 million units it sold last year.